← Cobblestone Farm Market Dinner – gluten-free, vegan, and makes my body oh so happy! 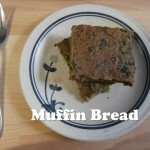 Here is an experiment that probably won’t turn into a recipe in this blog. But I am intrigued, so I figured I would share a picture. I’ve been thinking about creative things that I can do with my checkerboard cake pan set. Checkerboard cake pans make three layers of cake. You use a divider to put three concentric rings of batter into each pan, alternating between two colors of batter. Then you take out the divider and bake the cake layers. When you stack the layers in the right order and use frosting to stick them together, and you slice the cake open — you find a 3×3 checkerboard inside. Fun! 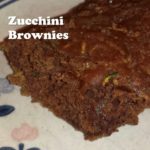 I’ve posted my recipe for Zucchini Brownies. 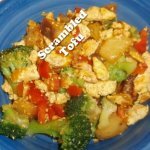 There is another recipe that I make, which I haven’t posted yet, called Summer Squares. It is a super-healthy cherry-vanilla version of the zucchini brownies. So I mixed up a batch of the ingredients that are common to both recipes and divided the batter into two bowls. I added the chocolate ingredients for zucchini brownies to one bowl, and the cherry vanilla for the Summer Squares recipe in the other bowl. Then I baked it in the checkerboard cake pan set. 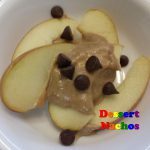 I’ve been intrigued by using sweet potatoes to make frosting. So I did that, using a Japanese sweet potato with white flesh. That made a lovely creamy-colored nearly white frosting. 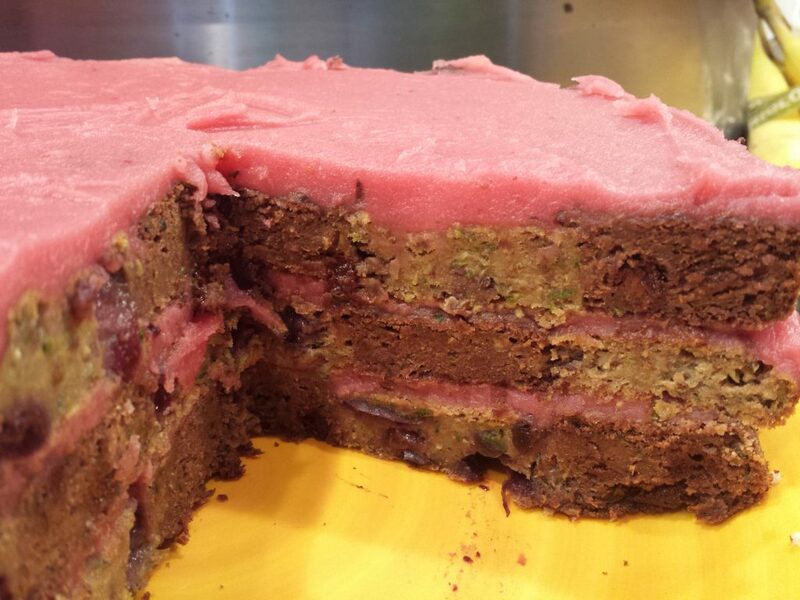 But pink is more fun, so I got out a tiny bit of pureed beet from my freezer and added that. Voila — vivid pink frosting! The resulting cake came out on the gooey side. Because I used teff flour in my flour mix, the white parts are more brown than I’d like. But still, this turned into an intriguing invention. 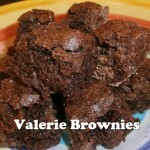 Valerie Brownies - gluten-free, dairy-free, and awesomely yummy!! !